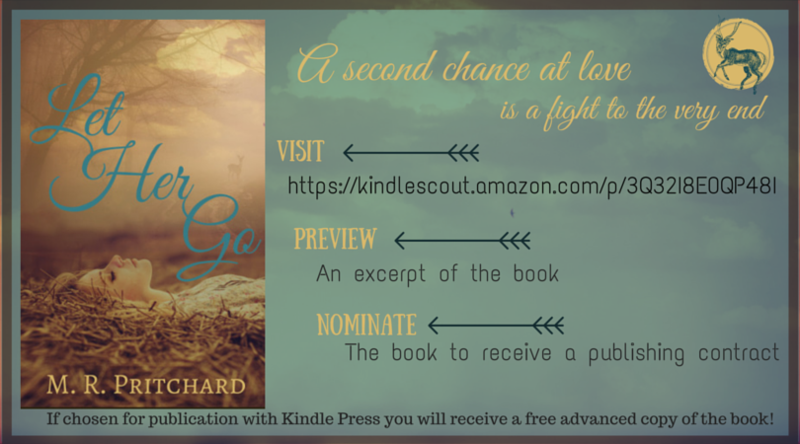 Let Her Go on Kindle Scout – Read & Nominate! Every year I enter a book in to some type of contest, last year it was SPARROW MAN in the Amazon Breakthrough Novel Awards. That book did very well but didn’t make it to the final round. FYI: LET HER GO is a contemporary romance, it’s a bit different from my regular stuff. If chosen for publication with Kindle Press, you will receive a free advanced copy of the book for your nomination! Morgan’s life is in a downward spiral. She’s left picking up the pieces after the tragic death of her perfect husband while the tabloids, pesky neighbors, and an eight-point buck seem to haunt her. The only thing keeping Morgan grounded is her recently discovered love for running. Everything changes when she finds out her husband was keeping secrets and he leaves Morgan to run his successful gym with her newly acquired business partner, stoic MMA fighter Nick “The Strangler” Stacks.